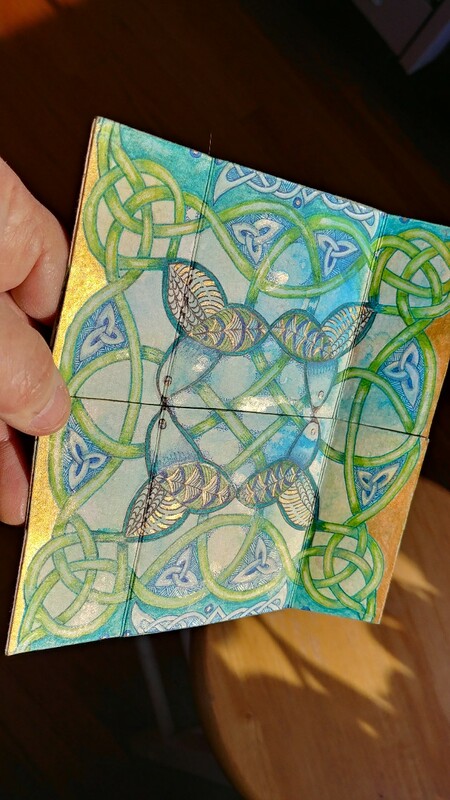 Recently I finished a crazy and fabulous project inspired by Jill McDowall, after reading her Infinity Flip Card blog post and seeing some of these fun square “flexagons” on her Instagram feed. 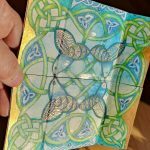 Have you seen these cards before? 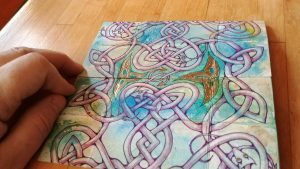 Also known as Never Ending Cards, hey’re basically made from two square cards or sturdy paper, scored, folded and cut in half, then glued together in a certain format. 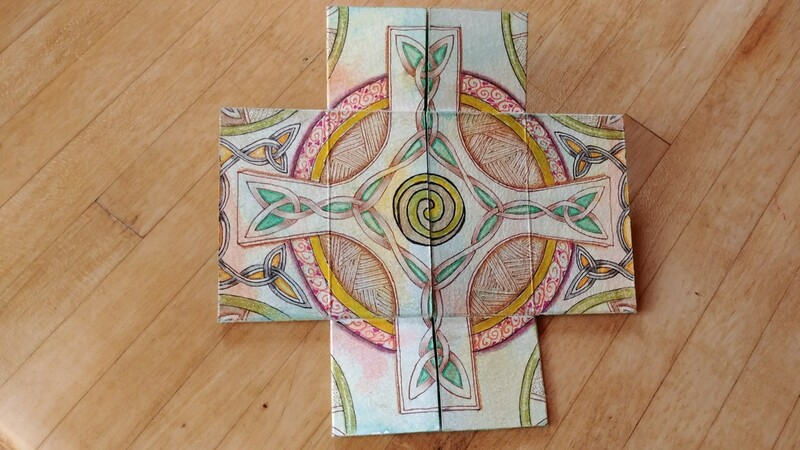 You then have a way to flip and fold the piece into four different sides, and when drawn, painted or embellished, you have 4 different images to flip and view, BUT if you turn the cards over and flip, you get 4 more views that have been cut in half and flipped again. 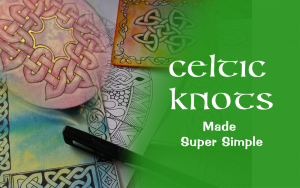 Since I was in the mood for drawing more Celtic knots, that’s where my mind went immediately. 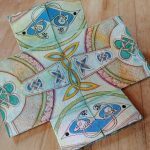 I love a good challenge, and the possibility of 4 drawn panels that could become 8 different views drew me in. 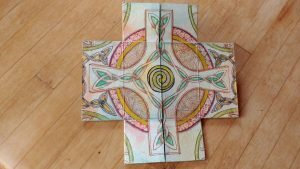 I can also see great possibilities with this form using other drawing styles too, like Zentangle, mandalas and nature drawing as well as painting. 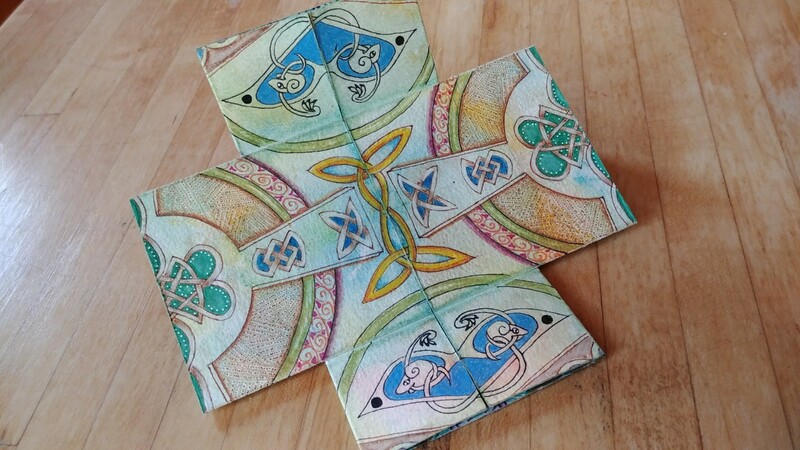 I started out with two different knotwork spreads on the card, and when presented with a 3rd flip where the card almost looks like a cross, I knew that I needed to make the last two into Celtic Crosses. 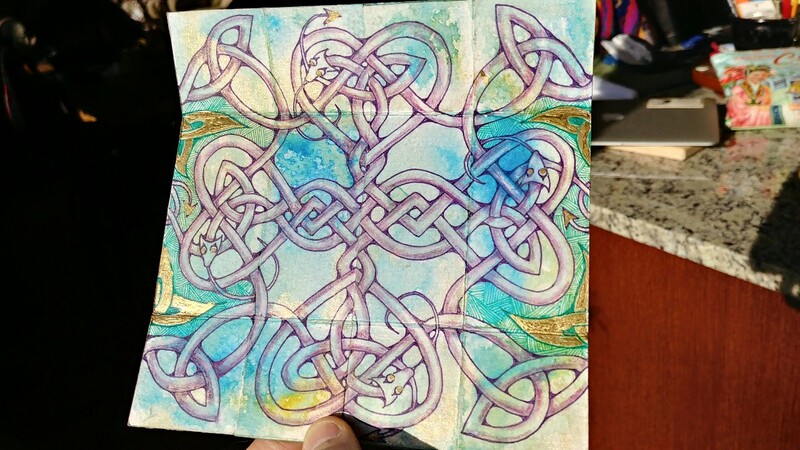 I immediately wondered if and how I might make any knotwork designs be more cohesive by somehow joining them when flipped in reverse. This took a bit of coordination. 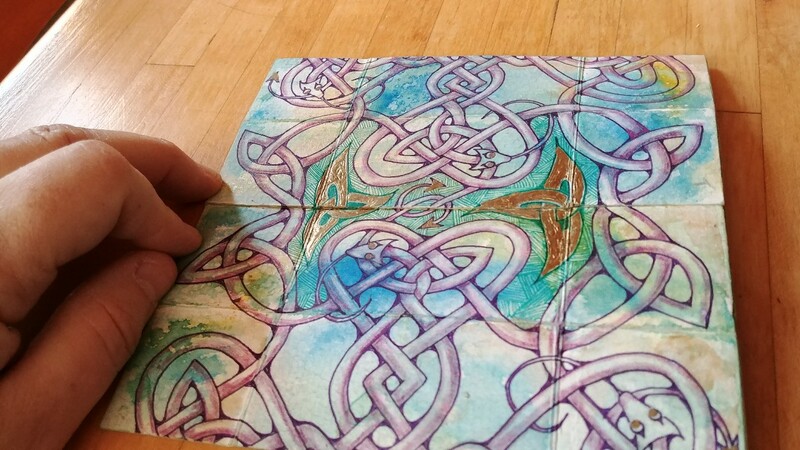 The full knotwork panels were a little easier to join together once reversed. 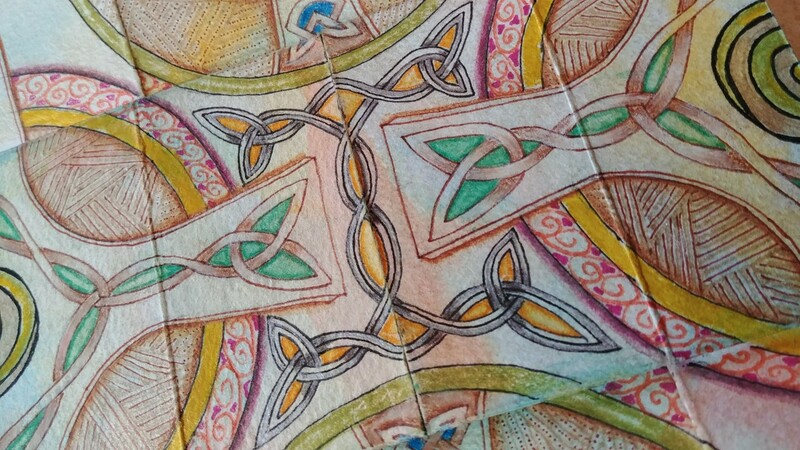 The two crosses however, took quite a bit of re-penciling and erasing and re-penciling to see how the reverse views might be coordinated without messing up the original view. 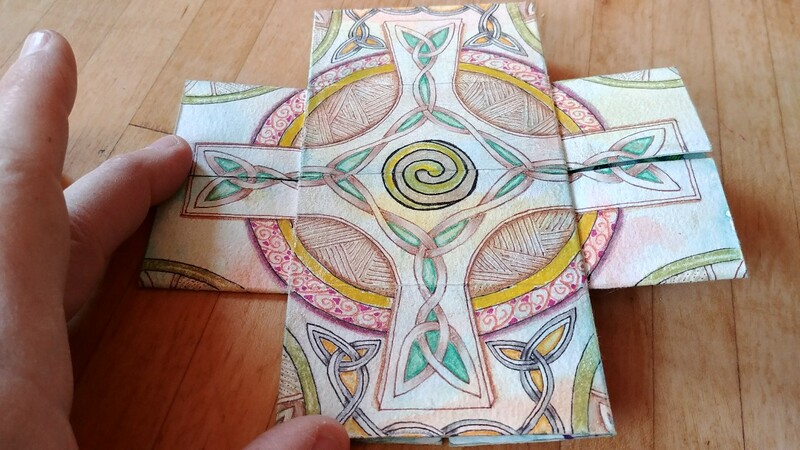 This involved using a ruler and compass to get the placement more centered and even then, since my folds were slightly off, I had to fudge some of the edges in places. 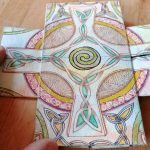 This was not exactly the MEDITATIVE part of drawing for me, but once I had my pencil lines coordinated, the rest was gravy and the calm focus flowed and flowed! 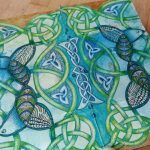 Micron pens in a black, green, blue and red. 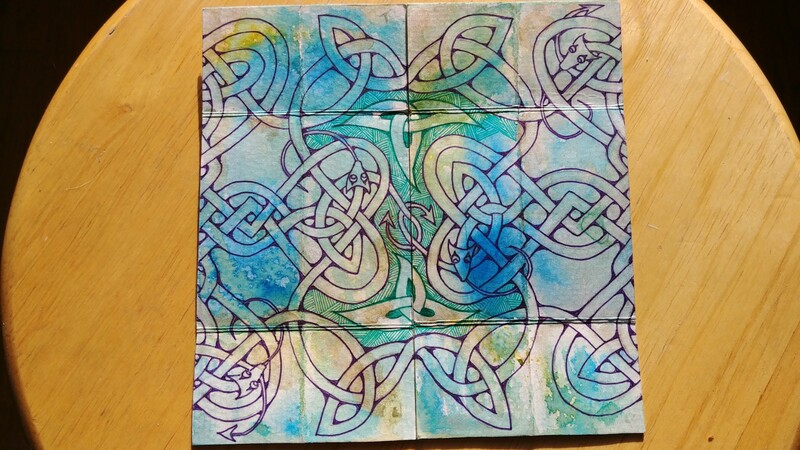 I started working on this card sometime in December, and finished it the first week of January. 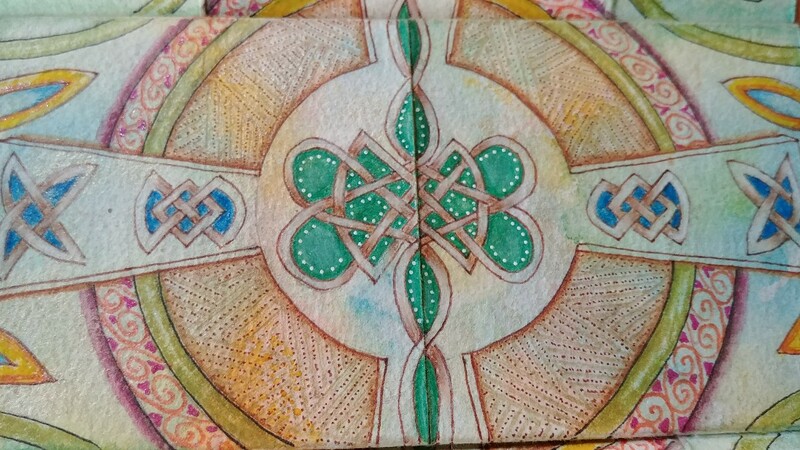 It represents MANY blissed out hours of work, (Ok maybe I became a bit obsessive in my tweaking efforts.) 🙂 And yes, I’ve started another one! 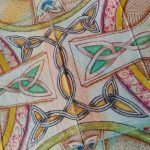 You might recognize a few 3 pointed Triquetra knots in the images above… they were really helpful for unifying parts of the flipped images! 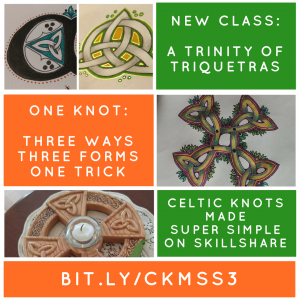 Speaking of which…I’ve just published the THIRD Skillshare class in the Celtic Knots Made Super Simple series all about Triquetras and some neat projects you can make with them.! 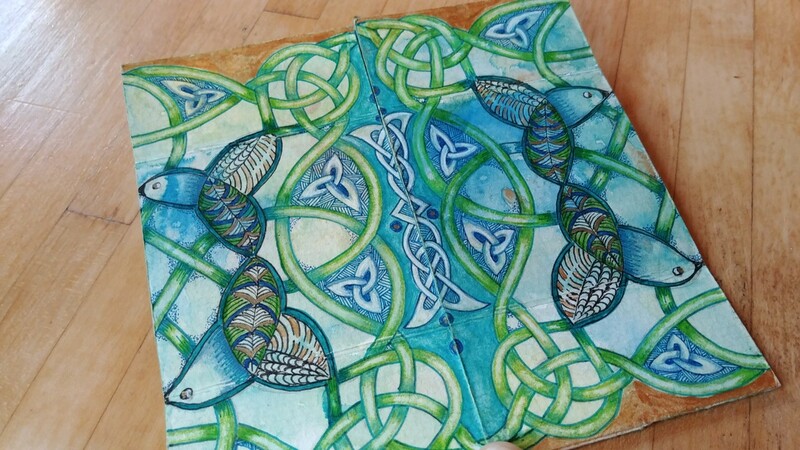 If you’re already a premium member of Skillshare, all you have to do is visit http://bit.ly/CKMSS3 to get started watching! 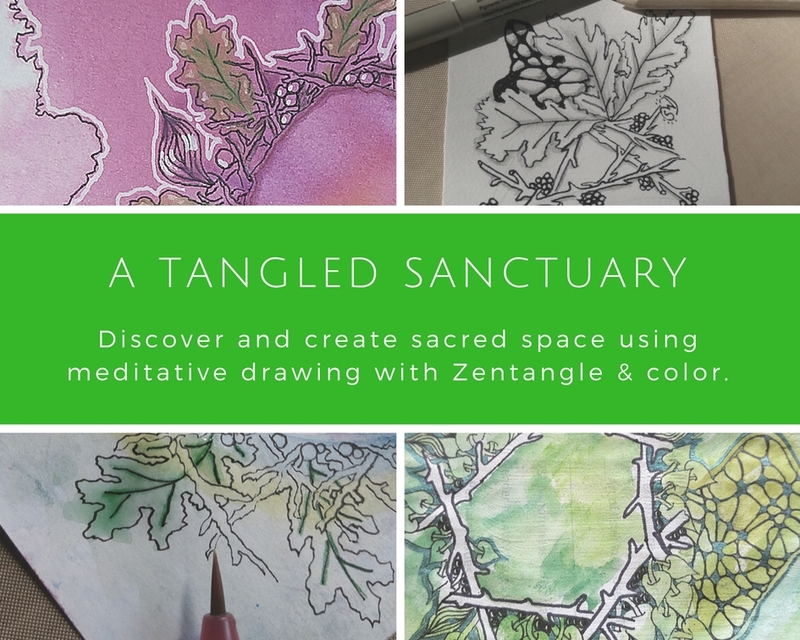 If you haven’t tried Skillshare yet, sign up for my VIP community email list and I’ll be reminding folks about some limited-time free links in the next day or two. 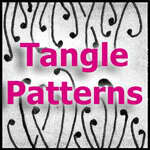 Don’t forget to Follow Me on Skillshare for special Skillshare-only updates! 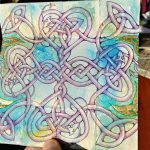 If you’re interested in getting access to an entire network of great classes in MANY topics, including art, cooking, technology, business and more, I encourage you to try Skillshare Premium out for just .99cents for three months. It’ll give you a sampling of courses. I look at it like “Netflix for learners”. 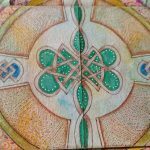 Creative Calm Live Online Circles – monthly FREE online gathering time with a guided creativity exercise Sign up for the VIP Community Email List for invites. 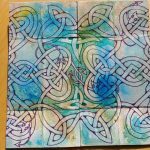 This entry was posted in Book Arts, Celtic Knotwork, Video and tagged Celtic, Celtic knotwork, mixed media, project, video. Bookmark the permalink.